Trailings at Ah Heng placer mine. 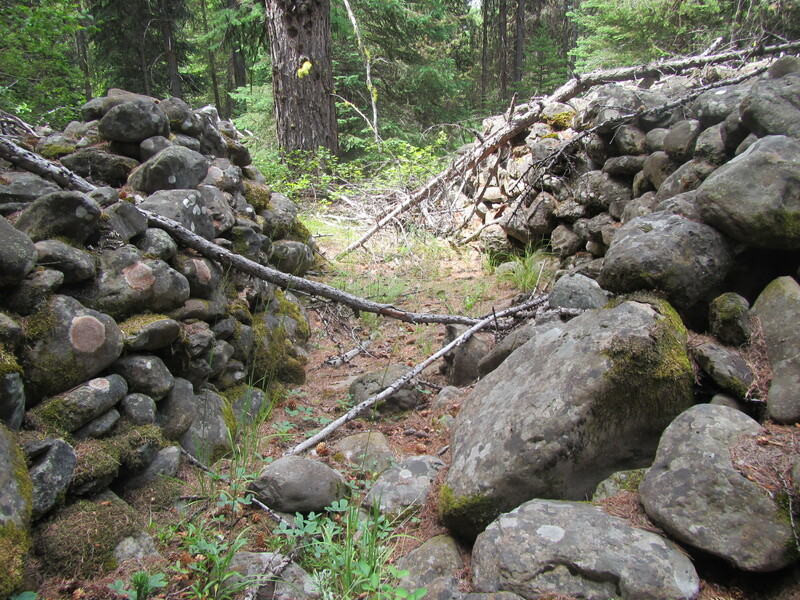 Flumes and sluice boxes were likely located within these low walls. Photo by Don Hann, Malheur National Forest. The Ah Heng placer mine is a gold mining complex located on a tributary of the Middle Fork John Day River. It was leased by the Ah Heng Company, a Chinese co-partnership, from A. K. Jackson and J. A. Wallace on May 31st 1887. 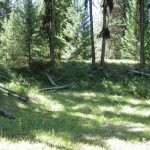 The six year lease covered seventeen acres and included the following associated property: one mining ditch, all flumes, sluices, drains and a log cabin. The Ah Heng Company paid $4,000 for the lease, the equivalent of just over $100,000 today. That amount of money is an indicator that this was a productive claim worth a substantial investment. Evidence of that investment which remain on the site today include segments of riveted steel pipe, called penstock, a ditch network, extensive tailings piles, and a large earthen dam. The dam is one of the largest earthen mining dams found in the area and was used to build up the water pressure needed for the hydraulic nozzles (called monitors or giants) which the miners used to blast away the hillsides in their search for gold. The wide, flat valley below the dam was created when the gravel and sediment containing the gold were washed away. The larger rocks which remained behind were stacked into the tailings piles and wall visible on the valley floor. Much of this historic gold mine was destroyed by later mining efforts which extended intermittently through the 1980s. 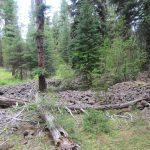 Luckily several acres near the head of the mine remained untouched and provide a glimpse at the scale and complexity of the placer mining effort. Take a virtual tour of the Ah Heng Company placer mine on the Malheur National Forest website by clicking here! Download or print the Virtual Tour pdf to take along if you want to explore the site itself (usually accessible May through November). A GeoCache has been established on the site. For more information visit the GeoCaching.com website. To reach the Ah Heng Placer Mine from Prairie City head east on Highway 26 for approximately 15 miles to Highway 7. Turn left on Highway 7 for 1 mile then turn left onto County road 20. Drive west on County 20 for 26.7 miles to NF 2090. Turn right onto gravel Forest Road 2090. The site is approximately five miles up the Road. There is a vehicle pullout (just a wide spot on the road) on the right shoulder which has room for 1-3 cars. This is an undeveloped back county site. There are no trails or paths so watch for fallen trees, slippery rocks, and occasionally thick vegetation. Overview of placer tailings at the Ah Heng mine. Photo by Don Hann, Malheur National Forest. 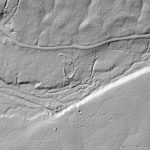 Lidar image of Ah Heng placer mine. The dam is the U-shape feature near the center. Photo by Don Han, Malheur National Forest. Earthen dam at the Ah Heng placer mine. Photo by Don Han, Malheur National Forest.